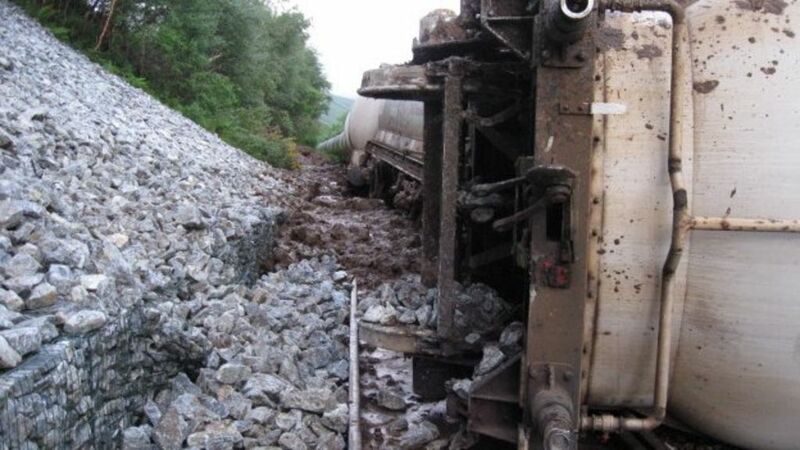 Network Rail has completed work on the West Highland line, which has been closed after a landslip and derailment. The section near Tulloch, between Crianlarich and Fort William, has been out of service since a freight train came off the line on 28 June. Regular rail services will begin on Wednesday. Network Rail completes work on the West Highland line, which has been closed after a landslip and derailment. The operation to reopen the West Highland Line and recover GBRf 66734 [see image 39479] is being managed from Tulloch and this ro-rail vehicle is seen there on 4 July 2012 about to take more workers to the site. During a brief lull in the rain 66734, with around 24 loaded wagons, approaches Brooks Level Crossing west of Cardross heading north on 28 June 2012. Later in the journey the train was to derail near Tulloch [see image 39479] with the locomotive subsequently being cut up on site, as a cost-effective recovery was not possible.